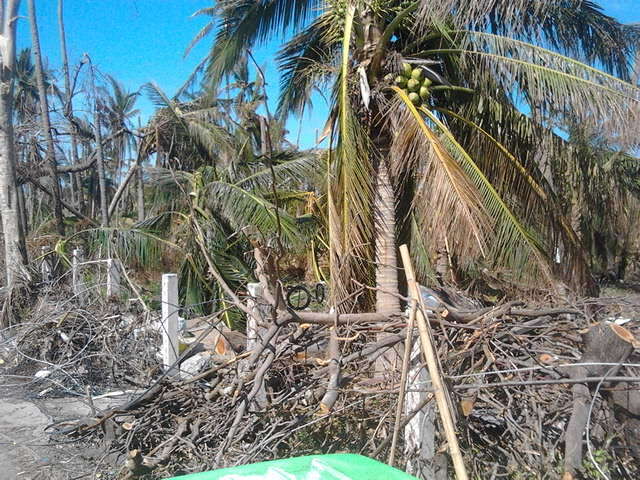 Our Super Typhoon Haiyan Relief Trip to Bantayan Island, Cebu, Phillipines. Sunday, November 17, 2013 - After Super Typhoon Haiyan (Yolanda), most of the media coverage was Tacloban City in the Leyete Island. 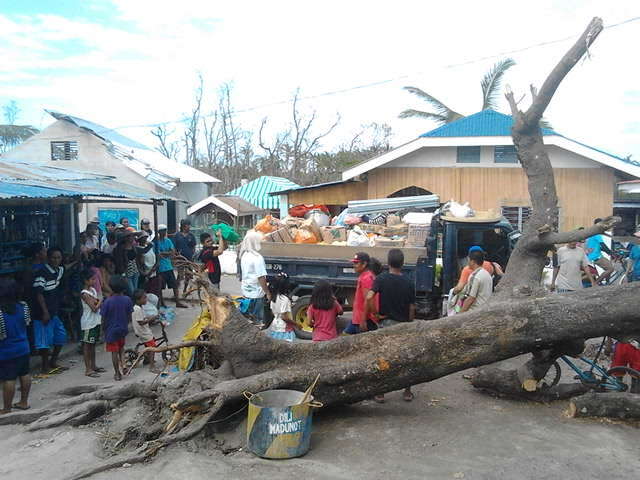 However, there were many other islands affected and in those islands, relief effort was minimal . And people lost everything as well. 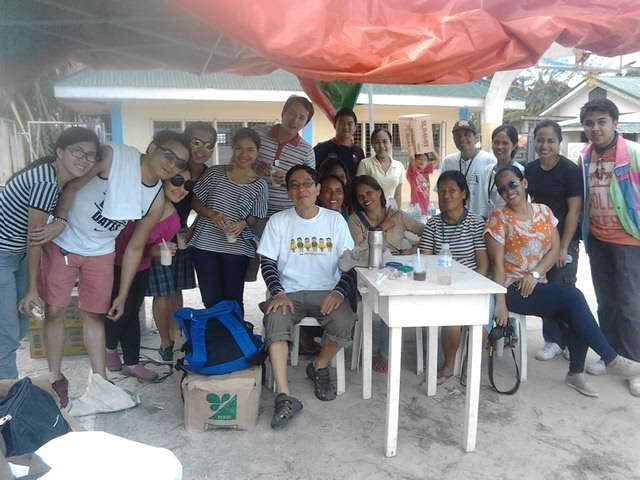 I joined up with 12 local people which included 10 nurses (5 male/5 female) who wanted to help the displaced people in Bantayan Island which is about 140KM from Cebu City. We left at midnight and arrived at a ferry terminal in Hagnaya at 3:30AM. Everything was dark there as the Super Typhoon Haiyan knocked out all the electrical grids as well as damaging houses. We had to get there early as not to miss the ferry. Even though we had reservation for 5:00AM ferry, there are limited spaces and limited number of ferries going to Bantayan and with the increased traffic due to relief operations, we could not leave until 7:30AM. It was rather hectic as there are no lights and people had only flashlights including reservation workers. Never mind using computers. Even in a normal situation, things do not move quickly here as it is all done manually with paper and pencil. In addition to what they received donation from various people, we donated 300KG of rice which would feed another 300 families. On the way back to the ferry terminal in Santa Fe, since we had left over boxes of bottled water and rice porridge, we stopped by on the side of the road where there seemed to be many people. We did not want to take them back as it better to leave it with needy people. A big mistake as when we started given out the goods from our truck, many people rushed up to the truck to get water that we were swarmed. Many small children were being pushed towards the truck tire. Finally, largest two male nurses got out and tried to control the crowd. This helped a bit but still it was like a mob scenen. We learned out lesion here. The need to work with village officials …. Always. 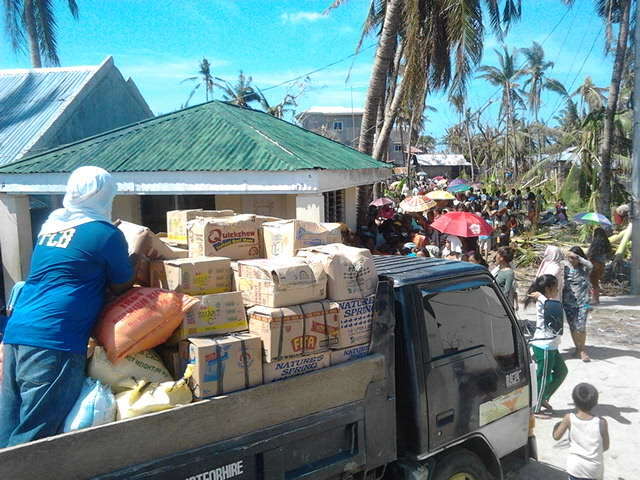 I was very impressed with these Philippine people who wanted to help their people in need. They are all in their 20’s. My hats off to them. I plan to go back to Pooc Village in Jaunary to assist Pooc Elementary School. 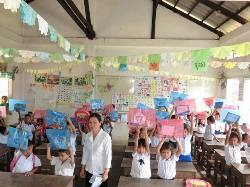 In Cambodia, we started supporting Kanpenh Chass Primary School in Sihanoukville Province in March, 2012. Sihanoukville is 230km from Phnom Penh, its capital. We also provided five scholarships to last year's top five graduating grade six honor roll students from Kampenh Chass Primary School who continue to go to local public secondary school (high school). 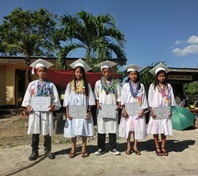 The scholarship provides school uniforms and supplies purchased by us given directly to the students. No money is exchanged. October 1, 2013 - At the Kampenh Chass Primary School (Sihanoukville) opening, we provided special school bags to returning top 5 honor roll students from each class Kinder to Grade 5 and school supplies consisting of writing pads, pencils, pens, erasers, sharpeners, rulers and plastic bags to all the students. David and Wanna from Coolabah Hotel came to help. September 28, 2013 - We went shopping with the last year's five Kampenh Chass Primary School's graduating G6 HR scholarship students to get fittings for their school uniforms, purchased gym shoes, school shoes and gym top/shorts which they are modeling with their new school bags with necessary supplies for them to start their Secondary one school next Tuesday. After all the shopping and lunch, they came back to school to stuff the school supplies for the 170 students for next Tuesday's primary school opening. 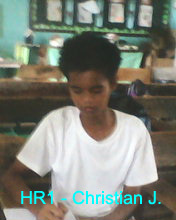 Activities were attended by two school teachers shown and David, who helped organize the activities. Without David, we could not make this possible. Thanks David! July 29, 2013 - On the last day of the school year, we raffled seven bicycles to each of the kindergarten to Grade 6 top five honor roll students. There were seven happy campers that day! Hopefully, many students will try to qualify for the bicycle raffle by trying to make it to the top five honor roll in thier class next year. August 24, 2013 - We had two consequtive weekend Computer Camps at Tuble Elemenary School to teach computer programming. Four 1.5 hour session each day attended by top 5 Honor Roll students from each grade for a total of 35 students including last year's five graduates. 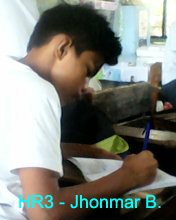 Teacher's session was also conducted beforehand. 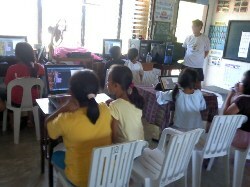 98% of the students never used computers before but by the 3rd session, they were quite adapt at using mouse and could create characters, color them, make it dance, and with the music as well, even the first graders who did not understand English well! 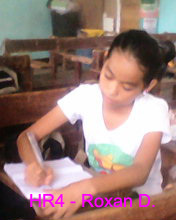 It showed that given opportunity, many students can have a better and brighter future. March 20, 2013 - On the last day of the school year, we raffled seven bicycles to each of the kindergarten to Grade 6 top five honor roll students. There were seven happy campers that day! Hopefully, many students will try to qualify for the bicycle raffle by trying to make it to the top five honor roll in thier class next year. 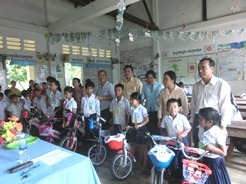 The exciting thing was that all the five top honor roll students has an equal chance to win the bicycle. 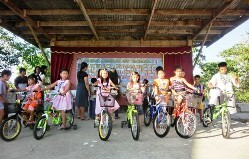 For all the winners, it was their first bike. 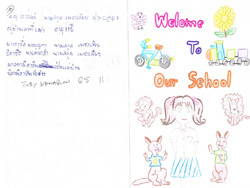 When we first started in 2007, our first project was a village school in Northeast Thailand called Ban Mahachai School in the rice farming village of Mahachai, Surin Province, Issan, 470km from Bangkok and 35km from the Cambodian border to the south. The village school had 95 students. Since the local government provided only a small amount of lunch money, we matched 100% of what the school gets from the government to provide additional dish or fruits for nutrition for the children. We also provided 760 writing notebooks and the school’s first playground equipment, a climbing frame. In 2009, we moved closer to Bangkok to a school called Swansiri, 90km from Bangkok which took about 2.5 hours to get there. There, we provided additional lunch money for the students including kidergarden children who do not receive any lunch stipend from the local government, similar to Ban Mahachai School in Surin. In 2011, we moved to Cambodia and to the Philippines as we gained more experience and also felt comfortable enough to go there and provide assistance as those countries' children have greater need. Often times, it is challenging to make sure that the children receive 100% of the benefits of the donation. We find that the only way to insure this is to do it ourselves and with a help of a local person whenever possible. Please join us and help those less fortunate than ourselves. Thank you very much for your interest.